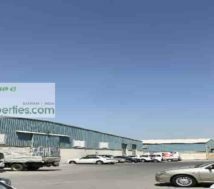 Low budget large warehouse complex for rent (6000 to 12000 square meters). Warehouse storage rent. Low rent warehouse in a private warehouse compound. 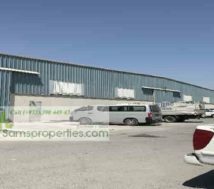 Large warehouse with minimum 6100 square meters. Commercial Warehouse with racking. Indeed, it is as good as a central supply depot which is in Sitra – Alba – Aldur industrial belt. There have two warehouses in this warehouse complex. That is to say that each warehouse is 6100 sqrmtr. The total two warehouses together will come to 12200 sqr/mtr. Indeed, this private warehouse is in a private yard. In other words, it is with four side wall and with large gate. In fact, there have good privacy and high security as well. Low rent warehouse @ BHD 2.500/month. 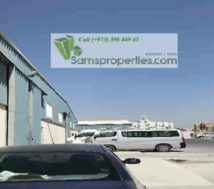 Of course, this low rent warehouse is a best offer which is just Bahrain Dinar 2.500 per sqr/mtr per month. Whereas the rent may have to negotiate as per the terms of rent period. The first three months rent has to pay when signing the agreement. In addition, the nine months rent has to pay by post date cheques. 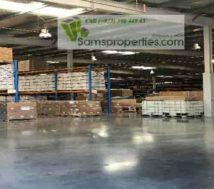 This low budget commercial warehouse is good for supplies and logistic firms. It is ready for Commercial Registration (CR) as well. Large yard which is good for visitors /staff parking as well as for heavy vehicles. The warehouse is with heavy duty racking / loading and unloading space / office cabins / CCTV / fire fighting systems / Intruder alarm systems. In addition, there have security guard and servant quarter / portable cabins for staff canteen – prayer area and much more. Above all, the warehouse flooring is well made to operate high rise reach trucks.